Our marine team is powering a new custom-built vessel for whale watching with Volvo Penta engines, engine monitoring and throttle controls that will improve the experience for Prince of Whales passengers. The currently-under-construction Salish Sea Dream will be powered by our team with four Volvo Penta D13-700 Inboard turbo diesel engines that will each supply 700 HP at 2300 RPM, providing faster acceleration and better ability to maintain high top speed. This allows Prince of Whales to offer passengers greater whale watching experiences, additional viewing opportunities and extended tours. The vessel’s Volvo Penta engines also offer the Dream dependability, low weight & fuel consumption, lower operating costs and the reliability demanded for tour operations. The engines were also selected for their environmental benefits with low exhaust emissions, certified to US EPA Tier 3 commercial marine and IMO II standards. Further environmental benefits are achieved with a longer engine oil change interval of 1,000 hours, reducing oil usage and waste oil management in addition to significant cost savings for the operator. Our marine division also supplied Volvo Penta Electronic Vessel Controls (EVC) and throttle controls to complement the propulsion system. The Salish Sea Dream is currently under construction at Armstrong Marine’s Port Angeles, Washington location. Pacific Power Group is a longtime partner of Armstrong Marine, who are ISO 9001 certified and trusted to provide high-quality aluminum boats and barges around the world. Gregory C. Marshall Naval Architects designed the vessel which will hold up to 94 passengers and will be compact and maneuverable at 24 meters, allowing the boat to get close to shore for wildlife viewing. The Dream is expected to launch and be delivered in May 2016. “The Volvo Penta D13 has proven to be a hardy workhorse for commercial operators. 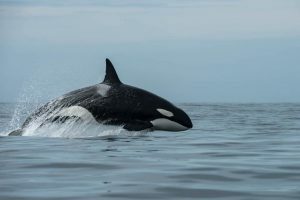 With exceptional torque at low RPMs and unmatched fuel efficiency and low emissions, it is the perfect engine to power the Salish Sea Dream for up close viewing of these amazing animals in their natural environment. Volvo Penta is proud to be onboard with Price of Whales, Armstrong Marine, Gregory C. Marshall, and Pacific Power to deliver the very best,” said Marcia Kull, vice president of Volvo Penta of the Americas.